A few days ago a group from Dokmai Garden hiked into a forest in the Doi Inthanon national park. 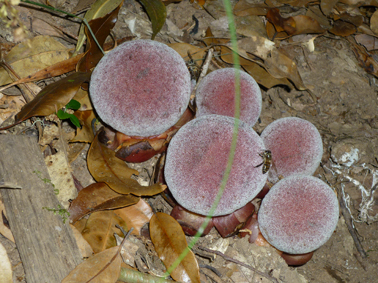 At 2200 meters altitude we saw some dark red ‘mushrooms’ on the forest floor, seemingly leaf-less. Our Hmong guide who hardly even spoke central Thai smiled and called it ‘Kanon Din’ which translates into ‘soil jackfruit’. Indeed the morphology of the female inflorescence of this Balanophora fungosa (Balanophoraceae) reminds one of a young jackfruit, but they have nothing in common. 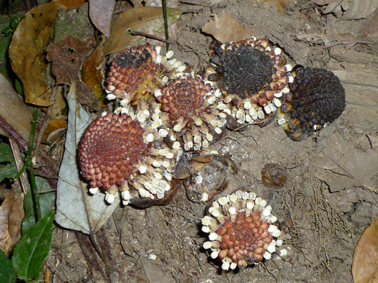 The scientific name ‘fungosa’ alludes to its resemblance to a mushroom, but this is in fact a parasitic flowering plant. The female flowers are very small, and apparently they attract bees and bumblebees. The literature claims it is pollinated by flies too. The scale-like leaves lack green chlorophyll and so it is unable to make its sugars, and must rely on parasitism. Male flowers are born separately. Dokmai Garden is a private Chiang Mai botanical garden, providing a gateway to the understanding of the nature and culture of northern Thailand. To visit Dokmai Garden's webpage, click on the image of the Buddha hand above. Fairchild Botanical Gardens, Florida, U.S.A.